I've had a spreadsheet running with the last full update of twitter followers taken on 4 Jan 2016. I've gathered some data on 14 March 2016 - 70 data apart. Even after five years of following police on social media, I still ask myself the question, What's the point of police officers being on twitter? For someone who has no clue, I give this reply..
Twitter is a free and fast realtime messaging service that allows a police officer to provide a volley of instant public updates to each other and to the public they serve. It gives those officers who choose to use it, an immediate and powerful weapon to keep the community informed and safe at a time when they need it most and when other areas are slow to react. And by other areas, I mean mainstream media like newspapers, radio, TV and even their own police force press and communications office. It takes away the middleman in all this and just takes the officer's eyes and ears and sends that immediately to the public twitter stream in the form of text, photo or video - all for free and all from the officer's mobile in their pocket. The lead slide for this post shows 113 essex police officer twitter accounts sorted from most to least followers. The blue bars show the amount of followers gained or lost in the past 70 days. I consider followers to be the benchmark of importance on twitter as that's an indicator of who may read your messages. I would say if a user has 100 followers, then a 1% read rate may be usual. On a terrific day, 10%. These are very general statements - only way to tell for sure, go look in your own analytics.twitter.com (impressions and engagements). Let's say there are around 3,606 Essex Police officers (ref) and with 113 on twitter, that's approx 3%. This is worth bearing in mind when we talk about Social Policing on the Internet. The main Essex Police UK twitter account has 122,000 followers in a population of 1.7 million is Essex, again 7%. Twitter in my view, should be a place where officers want to be there and want to engage with the public. And most importantly, to be allowed to use their own creativity and imagination to align seamlessly with their own set of followers. This makes twitter only a part of what is possible to engage with the public and issue timely messages. I class a timely message in three areas: 1, Official and Urgent 2, General awareness and 3, Banter. Other examples are face to face word of mouth, community meetings, posters on a noticeboard, advertisements on buses, print newspaper, a force website, facebook or youtube. 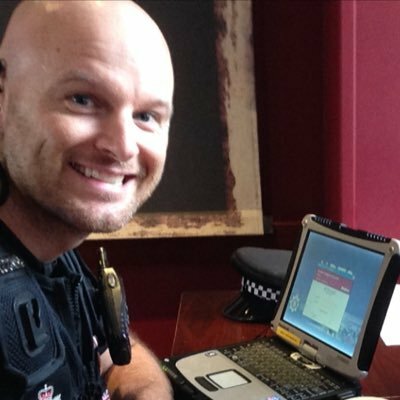 I'm delighted to devote the rest of this post to PC Alan Conran in his own words on what it means to be on Twitter..
For me it's about letting the public get an insight into what the police are actually dealing with these days. The beauty of it - it takes less than thirty seconds to compose and send a tweet on the way to, at or when an incident has been resolved. I've quickly learnt that I'm able to reach a wider audience with a quick picture taken 'on the ground' as it catches the eye and indeed the eye of the local press agencies. Some of the tweets I've sent have in turn been picked up by the national press. I'm in the position now where I'm trusted in the community with people coming to me as a point of contact with any concerns or information they have. I do see social media as the new neighbourhood policing as it's a medium people feel comfortable in using and if the police are there also it helps to give the public a face that they can relate to. I'm still out there doing my job and now the public can see that. I remember when I joined the police force being told that it's no use walking up and down streets with a yellow jacket on. People won't necessarily see you and they won't necessarily feel reassured that you're there doing what you do day in day out. However, if you walk the same route and take the time to say Hello to people that minute interaction goes a long way. Twitter is only different to me putting on that yellow jacket and my custodian helmet and walking through the area saying hello to everyone I see, in that more people are able to see me out there and hopefully they feel reassured by that. PC Alan Conran has over 50 articles at the Essex Chronicle.